London is blanketed in snow at the moment. 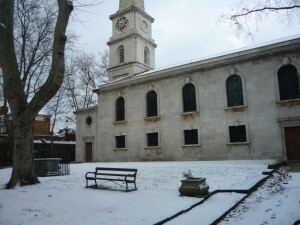 Dragging my little suitcase gingerly over the icy pavements, I managed to get in to the LSO St Luke’s Centre this morning to rehearse for my first concert of the year, the first of four concerts by the Florestan Trio in the LSO St Luke’s on consecutive Thursdays this January. Today, unusually, we played two arrangements: Janacek’s string quartet nicknamed ‘Kreutzer Sonata’ in a version for piano trio, and then a trio version of Beethoven’s Second Symphony. In theory the latter arrangement was made by Beethoven himself, though the historical proof is not watertight. Some think that the arrangement was made by a pupil or friend of the composer. However, the piano trio version was published in Vienna, with Beethoven’s name on it as composer and arranger, while Beethoven was living there, and knowing his character it seems inconceivable that he would not have protested if the publisher had taken his name in vain. When we first played the 2nd Symphony as a piano trio, the audience seemed divided as to whether it was a worthwhile exercise or not. Some were very enthusiastic, others disdainful. Some thought that it was really just a way for 19th-century music lovers to get to know the work at home in the days before recordings were available. So I was not sure if I was looking forward to playing it in concert again, and having it recorded by the BBC for radio broadcast on Tuesday 2 February. But today the audience seemed thoroughly gripped, and after the concert we had a very enjoyable hour in the downstairs café with lots of people coming up to our table to say nice things about the performance. Perhaps we played it with more conviction than formerly. This entry was posted on Thursday 7th January 2010 at 5:40pm	and is filed under Concerts, Florestan Trio. You can leave a response, or trackback from your own site.